SCVHistory.com HS1904 | St. Francis Dam Disaster | Historical Society Trio Lauded for Work to Remember Dam Victims, 2019. Historical Society Trio Lauded for Work to Remember Dam Victims. SCVHistory.com | January 28, 2019. From left: Alan Pollack, Dianne Erskine-Hellrigel, Councilwoman Laurene Weste, Ann Stansell. Click image to enlarge. Three members of the Santa Clarita Valley Historical Society were thanked by the City of Santa Clarita this week for their work to memorialize the victims of the 1928 St. Francis Dam disaster. The former dam in San Francisquito Canyon, part of the L.A. City aqueduct system, collapsed just before midnight Monday, March 12, 1928. Nearly 13 billion gallons of water were unleashed on sleepy residents from Saugus to the sea. An estimated 411 people perished in the flood. It was California's second deadliest disaster after the 1906 San Francisco earthquake. The St. Francis Dam Disaster site is a state historic landmark but has never been recognized at the federal level even though it was America's worst civil engineering failure of the 20th Century and prompted dam safety measures that are still utilized today. 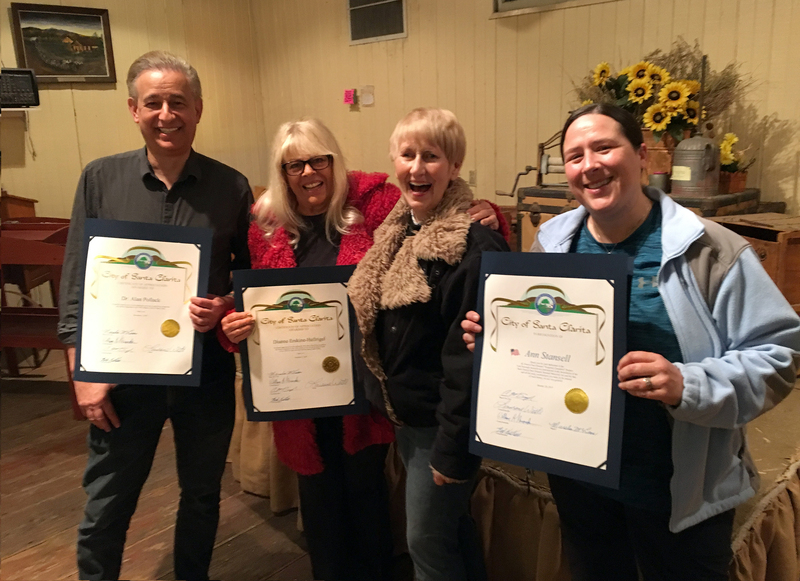 City Councilwoman Laurene Weste presented certificates to Historical Society directors Alan Pollack, Dianne Erskine-Hellrigel and Ann Stansell for their efforts to raise public awareness of the victims who paid for the development of Los Angeles with their lives. Stansell was the first researcher to put names to casualty numbers in a comprehensive manner. As a graduate student at California State University, Northridge, she spearheaded the "Forgotten Casualties Project," which identified each individual victim (some of whom may never be known) and determined their final resting places. Stansell holds a master's degree in anthropology and now works as a National Park Service archaeologist. Pollack, president of the Historical Society and a medical doctor by profession, came up with the idea to have the disaster site designated a national memorial after visiting a similar dam disaster site in Johnstown, Penn., which has the federal designation. Pollack teamed up with Erskine-Hellrigel, president of the local Community Hiking Club and a veteran promoter of environmental legislation, to draft and lobby for passage of the Saint Francis Dam Disaster Memorial Act. The act cleared the House of Representatives in the last congressional session and has been reintroduced in the Senate this year. The legislation, which incorporates Stansell's and others' research, would designate 353 acres of already federally owned Forest Service land as the memorial site and would accommodate a visitors center to be built with privately raised funds. Pollack and Erskine-Hellrigel have established the St. Francis Dam National Memorial Foundation for that purpose and are actively seeking monetary pledges. The Historical Society will hold two events in March to mark the 91st anniversary of the disaster. The society's annual lecture at the Saugus Train Station and bus tour to the dam site will be held Saturday, March 9, 2019, from 11 a.m. to 4 p.m. On Sunday, March 31, the society will host a 52-mile bus tour of affected properties in the flood plain from Santa Clarita to Santa Paula. The March 9 lecture is free; the March 9 and March 31 bus tours are ticketed events. For information and reservations, visit SCVHS.org or call 661-254-1275. HS1904: 9600 dpi jpeg from digital image.